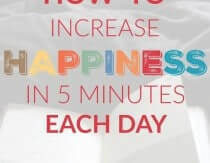 Heather Dessinger 172 Comments This post contains affiliate links. Ready, Set, Bake! 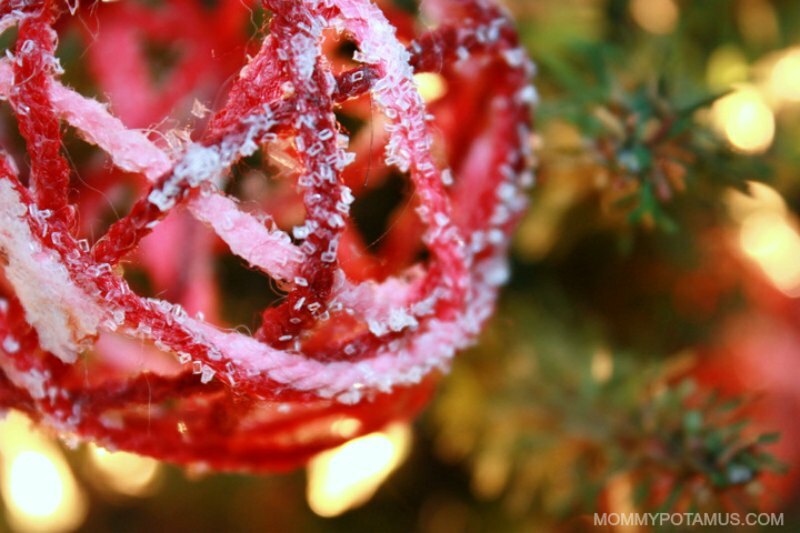 This salt dough ornament recipe is as easy as 1-2-3, but I broke it into ten steps so that I could include more pics of my kiddos – ha! If you’re looking for a fun project to do with your kids for the holidays, THIS IS IT. Katie, my six year-old, did everything on her own except the baking, and four year-old Micah only needed help a few times. The best part? After all the fun is over you have a sweet keepsake for your tree – and possibly a gift for the grandparents, too. Now, if you saw the photos in Levi’s birth story you **may** have noticed I like bright colors. My Christmas tree is no exception, but these would be beautiful with more traditional colors, too. Quick note: I’ve gotten some questions about how to make this recipe without wheat flour, so I did some testing and posted my gluten-free salt dough recipe here. Step 1: Preheat oven to 250F. 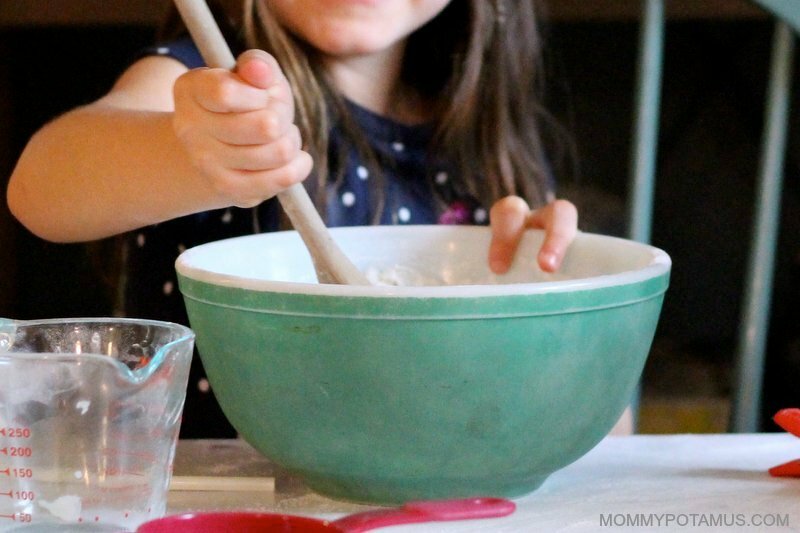 Measure flour and salt, then add them to a medium mixing bowl and stir. Step 3: Mix thoroughly. Sprinkle parchment paper with flour and knead dough until it’s soft and pliable. Add more flour if it’s ultra sticky. Step 4: Using a lightly floured rolling pin, roll out the dough to 1/4 inch thickness. Step 5: Cut out ornaments using cookie cutters. Step 6: Peel away dough and lift cutout. Step 7: Place cutout on and ungreased cookie sheet. Step 8: Using your straw, create a hole for the ribbon that will hang the ornament. 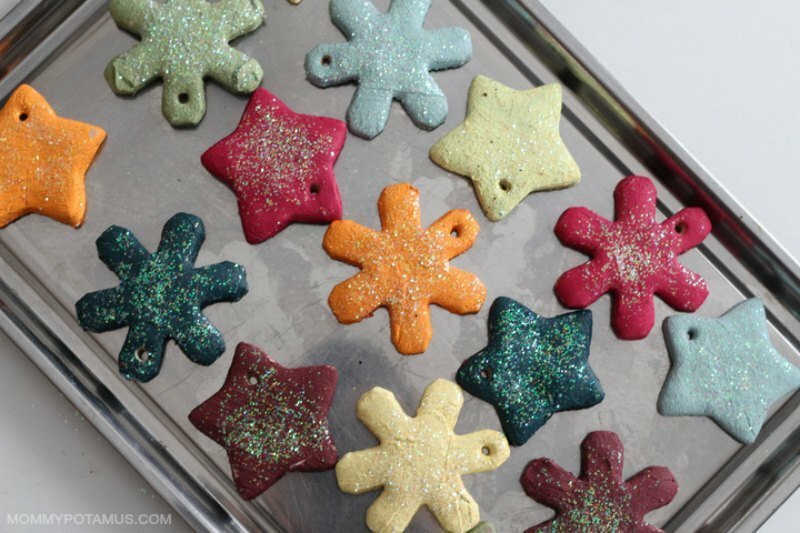 Place ornaments in the oven and bake for two to three hours, or until completely dry. Flip once while baking, then remove and allow to cool completely. 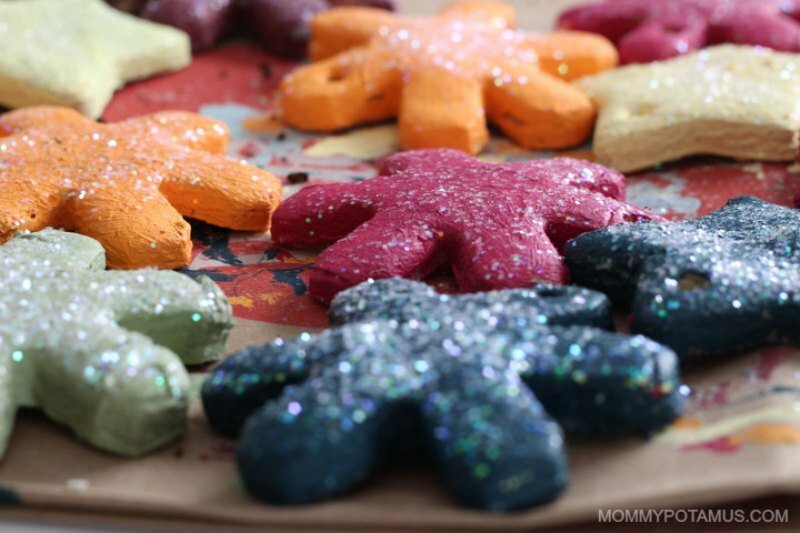 Step 9: When the ornaments have cooled, decorate them with paints and/or glitter if desired. Step 10: Snap selfie, because while you **may** have managed to prevent your preschooler from painting the kitchen table, you did not prevent him from painting you. We made these yarn ball ornaments a few years ago. They’re one of our favorites to hang on the tree! 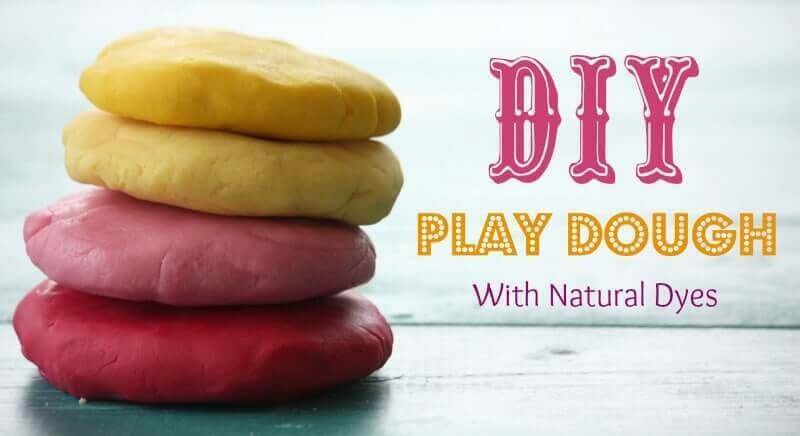 This fun, easy play dough recipe uses stuff you probably already have in your fridge/pantry, and there’s a gluten-free option at the bottom for those who need it. It’s squishy yet crumbly. You can mold with it or smash it to smithereens. What is it? MOON SAND! If you haven’t heard of it, here’s what you need to know: Kids love it, and you can make it in under 10 minutes from stuff you already have in your pantry. Here’s how. I wish I lived in a less humid place! I was looking for something on my tree! This is it! Thank you! I love this! I have been saying I want to do this project with the kids this winter but just haven’t gotten around to it. I think we will do them tomorrow during the snow storm coming our way. You could buy real clay from the craft store. 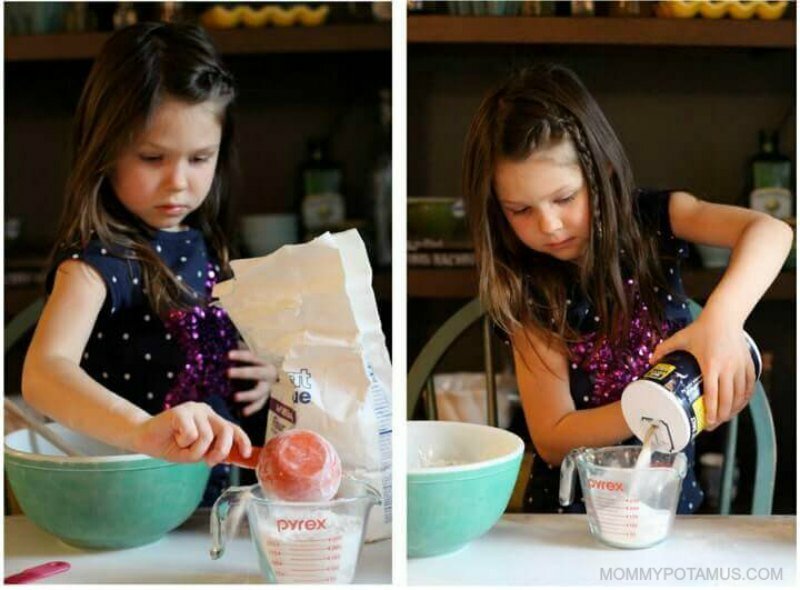 You won’t get to make te dough but kids seem to enjoy the rolling, cutting, baking and decorating parts anyways. I think Sculpty is a completely synthetic baking clay for kids crafts. How many ornaments can I get from one batch? It will depend on the size of the cookie cutters. My kiddos and I just finished ours up this morning! They came out beautiful! Mine came out darker on one side and they are pretty rough looking. I’m going to make one of these and put my daughters hand print in it for a ‘babies first Christmas’ ornament! It will be very cute. The hand print will shrink and distort a little in the oven. It may or may not be enough to notice. My friend warned me, so I purchased a special no distort medium from pottery barn kids. I am sure they sell something like that at craft stores. It will be a cute ornament, but it will not stay the exact size of her hand. I like your idea with your daughter’s hand print. My kids are all adults now, but we have a 4 month old puppy and I am going to use her paw print and make an ornament for her “daddy” to maybe hang in the truck. Does this have to be wheat flour? I don’t have any in the house anymore but I have plenty of others. Though, it’s cheap enough that I can probably pick up a small sack. Jillian Bourke – Ohhh, I we did that but I forgot to include it in the post! I need to take a pic and update – thanks for the reminder! Could this be done gluten free? I know we aren’t going to eat them, but I can’t be anywhere near gluten without getting very sick. Thanks! 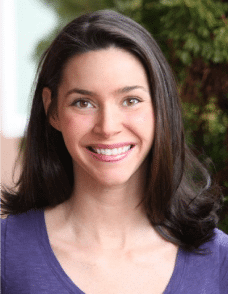 Kelly Marlene Geiser – What was the disaster? We may make these today. Kristin Fisher Lawler – Yes! I will try to post a pic soon, but I used a large coffee mug to create a circle and it turned out pretty good I think. I don’t have any paints on hand, could I put food coloring in the dough? Jillian Bourke- have you tried a Hallmark store?? They specialize in the sort of thing. Try Hallmark online? Did that this year, use half as much salt sub for cinnamon and they’re wonderfully scented. Melanie Nemeth we should do this when we come! Any suggestions if they’re not hardening up well? Courtney O’Connor Morse – I would just bake them a bit longer. You are so pretty mommy pot ! Thanks for the idea! I may have to do this with my niece. 🙂 And also, your kids are ridiculously gorgeous! Does anyone know if GF flour will work well? We’ve done this twice already this season. 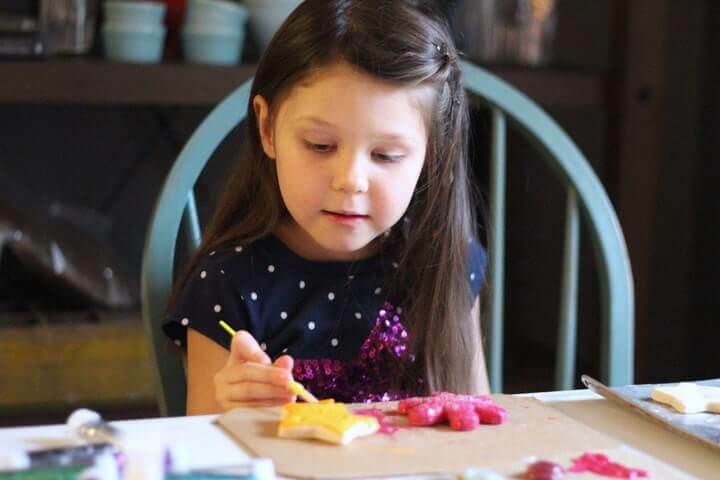 Kids love it and makes a great cheap gift for grandparents! Is that vintage pyrex i spy???? When I was a child my dad used a recipe very similar, we did not add any food coloring and instead of individually creating hanging ornaments individually we created a ornament wreath layering each of the cutouts. The entire reath was done in white I believe he is still at and very high gloss . To top it off we used a red bow at the top . It was so simple clean and so very beautiful . I think it is a great option for older children and families to do together, and a great great option. Melissa Yancer – YES! It was my grandmother’s. One of my favorite pieces ever. Sasha Smith Fernandez – So cute! Just came home from my last day at work and made these with my son to start the holidays – thank you! Back in 1985 I made dozens of salt dough ornaments to give as gifts as we were broke. I pinned DIY unpaper towels. Now that my kids are getting older my husband and I are talking about doing this! Yep, mine needed 2 hours. Maybe they are rolling their dough out thinner or baking at a higher temp? I can’t get this to pin 🙁 can u please email it to me? Thank u! Brings back memories…used to do this as a kid. Thank you! I made these with my kiddos today, when we needed something to create together and connect. It is SOOOO funny you posted this! I was plaaning on looking into this for my kiddos tomorrow! Perfect timing I would say!! Just wondering where you got your acrylic paints from in the picture? Me too Tiffany, for the same reason as Anna. Thank you! Do these last long?? Thinking of handprint or footprints…? You ave too much time. Thank you for posting this. I made them this evening and I am looking forward to putting the finishing touches on them with my 7yr old and her friends..
Melissa Yancer – If you coat them with a clear varnish (from the hardware store) to prevent moisture from affecting them they will last for years and years. More details in the post. I’ve done these several times and I usually heat the oven to 200° and I bake them for 3 hrs. 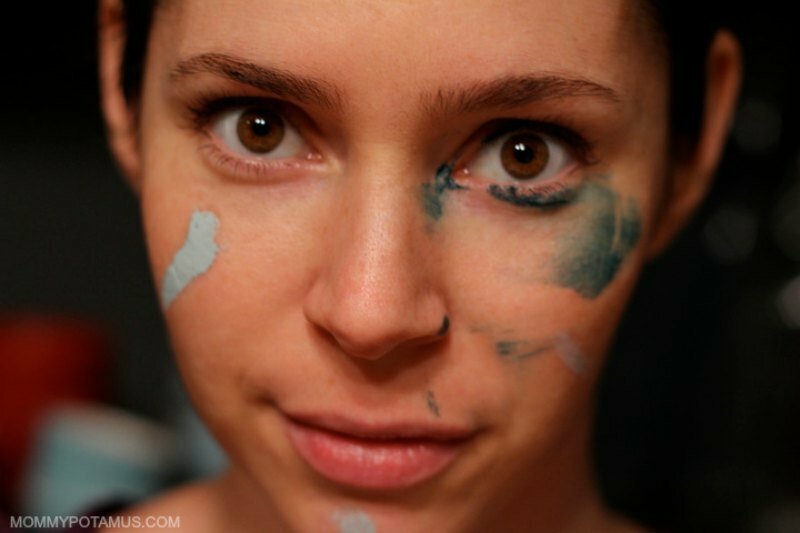 I use food coloring as paint and old shimmer powder from an old make up kit and I put it on before baking. Oops missed that part. Thanks! 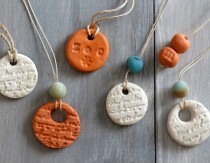 Could you make these smaller and use them as essential oils pendants? Or would the oil dissolve them? 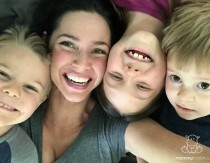 Love them, Caitlin Gibson! So cute! Christine Peterson Storer – I don’t think the eo would dissolve them but I don’t know for sure. Love this, it will be a great project for school break the couple days before Christmas! This is such a great idea for the Holiday season. 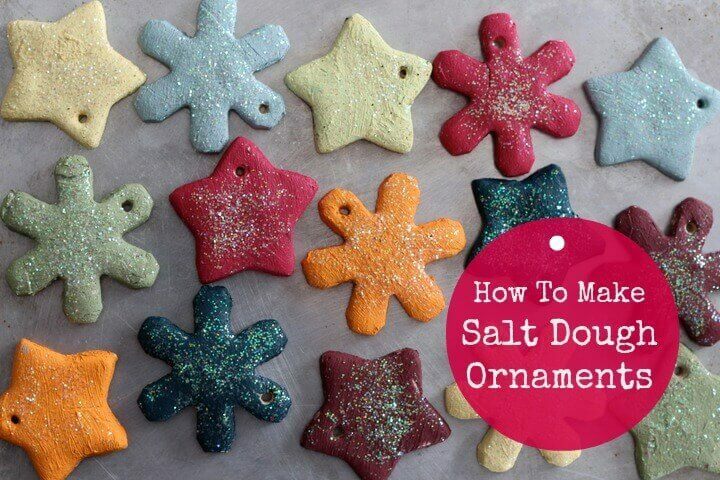 If you use a stand mixer to mix the dough, the time spend making the dough will be cut down so you can spend more time decorating and end up making more ornaments. I will definitely have to try doing this with my niece and nephew before Christmas! Thanks for the recipe. Do you polyurethane before or after painting? After! Thanks for asking, I didn’t realize the instructions were unclear. Updating now. Can you use self rising flour or does it need to be a different kind? I’m not sure, Nikki. I just used plain ole all-purpose flour. We have handprints in the oven right now! Did you flip the handprint ones that you did as well? Wasn’t sure if they’d lose their impression? 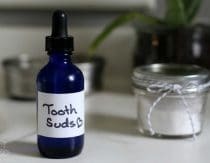 I am trying these for the first time to do with my 2 1/2 year old. (Fingers crossed!!!) How can you be sure they are completely dry? I used the same snowflake cutter that was shown in the picture and the middles are raised (puffed out) a bit and a slightly different (darker) color than the arms of the snowflake. They have been in the oven for 3 hours. I cant imagine that they aren’t dry but I’m afraid I will ruin them if they aren’t dry and we decorate them. Hi. I can’t wait to make these with my kids. What kind of paint do you get after they are cooled? Please email me [email protected] Thanks. Merry Christmas. I did hand prints in my dough. My dough bubbled in some of the finger prints. Any suggestions? I also did stars and they all puffed up in the center. Hi Christina, it sounds like maybe your flour was self-rising (containing yeast). If that’s the case, try making them with plain flour. Mine puffed up too in spots and I used regular flour…. My boys had a great time making these and it was so easy. I’m only having one little problem, they’re not drying out very well. I have my oven set to 200 and they’ve been baking for 3 hours. I flipped them after an hour because the top seemed done, but since then the back hasn’t changed much. The dough still has a slight give to it after another 2 hours. Almost a rubbery feeling. The only thing I can think of was that I ran out of regular salt so I mixed in kosher salt to make up the difference. Any thoughts? Hmmm, I honestly have no idea. So sorry I can’t be more helpful, Erica. How much dough does this recipe yeild? Need to make a bunch for our large family!! Thanks for posting!! 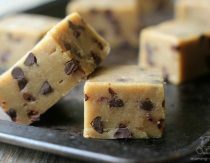 How would I store the dough if I pre-made it? I’m not sure how well it would do pre-made. If only made a day in advance it might be fine stored in an airtight container. Trying these right now for my children to decorate as the oldest wants all decorations to be hand made this year. I rolled them thin and it was a great dough to work with. Will it be ok to spray with protection after the holidays? Or does it have to be done the same day? Hello! 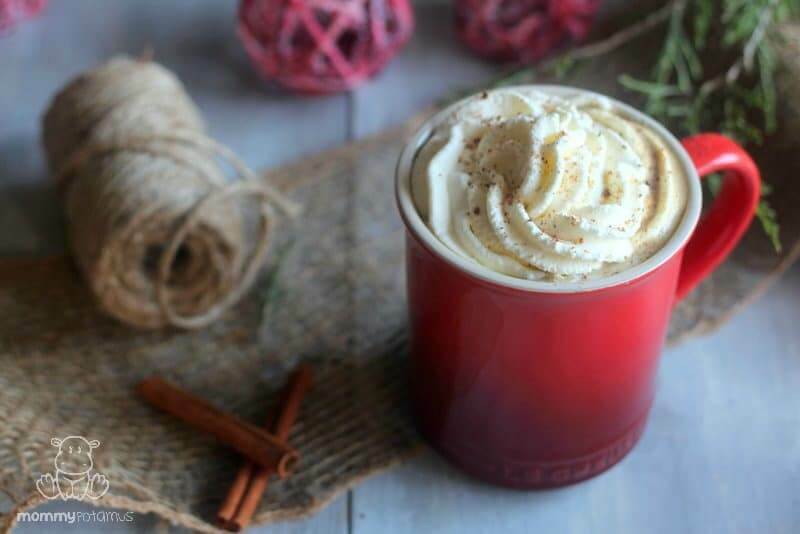 Getting ready to make this with my counseling kids at school- based on the ingredients that you have listed, how many ornaments can you make out this? Thanks! My wife and I baked 120 ornaments today for the kids at church to decorate. For those having long bake times, keep in mind if you are baking a lot at once, it’ll greatly increase the time they need to be in the oven. Just did this n they didn’t come out as I expected they bubbled up n turned brown n stuck to the pans 🙁 very disappointing was making them for my husband ( used baby’s feet) its our first child together just wanted to create a memory!! Hi Valerie, I’m so sorry they didn’t turn out as you expected. Is it possible that your flour was self-rising? From what I understand, that’s usually the cause of bubbling ornaments. Or the we’re too thin that causes the browning effect. Paint them they are still very usable, especially as a memory maker. Mine stuck to the pans horribly!! Any suggestion on how to fix that for next time? I have an urgent inquiry pleaseeeee. English is my second language and I didn’t understand what you meant by self rising flour, as it is really bubble up from me every time?? I need to make flat shapes. Just use regular white flour the cheapest you can find. That will solve your problem. Just put ours in the oven and it seems like they may be starting to crack. Is this because I didn’t knead the dough long enough? I also used fine sea salt, so maybe that’s the issue. Oven temps vary so set it lower next time. That might help. I usually have it set at around 50 and leave for as long as it takes.I’ve made a few ornaments including a Santa and a sheep. A garlic crusher is a great tool for beards, hair, fleece etc. Made these with my 5 year old. I like how nice and pliable the dough was. I baked them at 200 degrees for about 2 hours (250 was too hot–they started to get too brown). I had two problems with these: One, they stuck to my cookie sheet, and two, some of them got big air pockets underneath, and their undersides are rough and raised. Any suggestions? I would like to try this again with better results. Thanks! Hmmm, maybe try baking them on parchment paper? I’m not sure about the air pockets, though. So sorry! 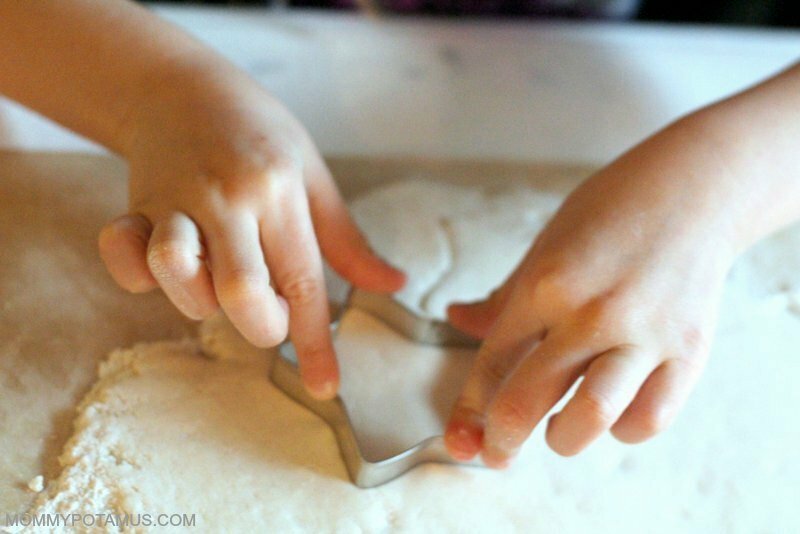 Can you use a cookie press instead of cookie cutters? They have to be completly dry before painting or sealing. Any moisture still indide will be trapped, and will have no way to escape. Make sure your oven is not too hot. Over 200 and they can bubble. Also, if they do start to bubble, a prick with a pin will release the trapped air inside. Justvprick and gently press it back down. Start the baking with your good side down. The salt rises to the top, so it looks whiter. Flip half way thru. Hope this helps, good luck! I tried this project and my ornaments look very white in one side and then the other side looks brown. They came out soft in the middle after 3 hours at 200F. I don’t know what to do. Any suggestions? It is rainy and the temperature is low here. I noticed yesterday that my finished salt dough crafts have become moist and soft so I baked them again and it worked, they hardened again. But when I wake up this morning, and it’s still cold, my crafts become moist and very soft (again)! 🙁 Is it because I didn’t put any finishing paints? Please check out my instagram to see the photos of my work, ”mom.preloved”. Please help me. Thank you! 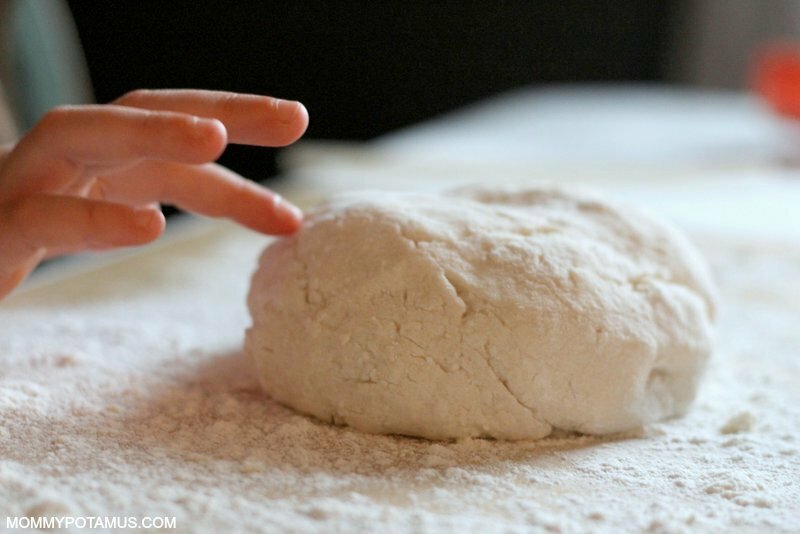 I made this dough using 2 cups flour 1 cup salt then I added water….that’s where I goof up. I added to much water. How can I fix this without messing up more. Can I add flour to it? Or salt? Will it still bake right? 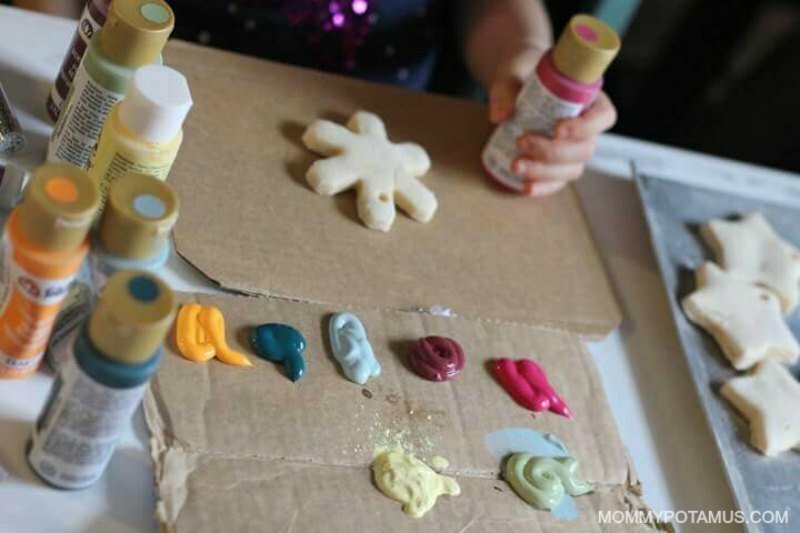 I just found your salt dough ornament recipe on Pinterest and have to tell you your blog with your kiddos included is so cute! I am going to use your recipe to make Michigan shaped ornaments to decorate a tree my work is sponsoring at an event called Circle of Trees. I can’t wait to start making and decorating the ornaments! How many ornaments does your recipe make? A friend of mine have me this recipe last year and had a blast with both my grandsons. This is a great ideal. But what do I seal it with to put outside in my flour garden ? Hi Heather, I’m interested in the sealer (clear finish) you linked to for sealing the ornaments, but I see that some reviewers mention a strong odor. Can you tell me if you found the product to have a noticeable odor? I live in high altitude, would I need to change the temperature for baking? I used wheat flour and it worked perfectly! I make gingerbread houses and believe I have a few tips for your readers. Use plain flour only. Read the label, it should not read self-rising or contain baking powder or soda in the ingredients. 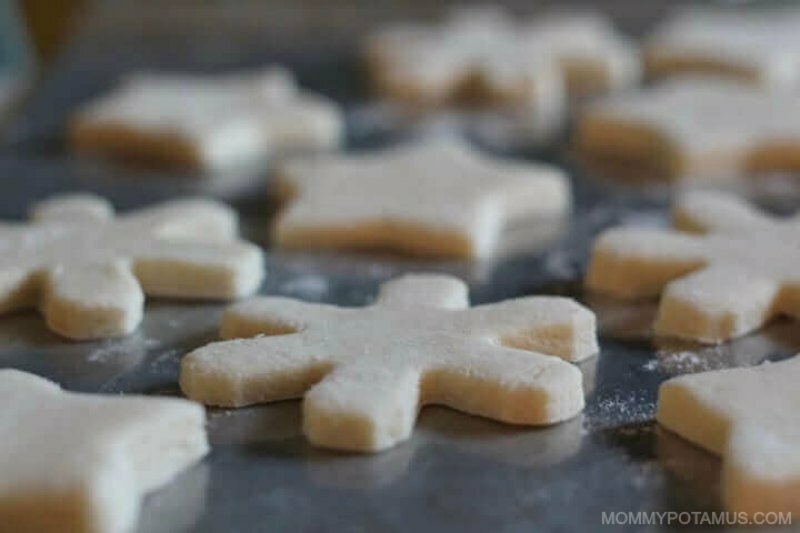 Roll dough out on a piece of parchment that will fit on your cookie sheet. 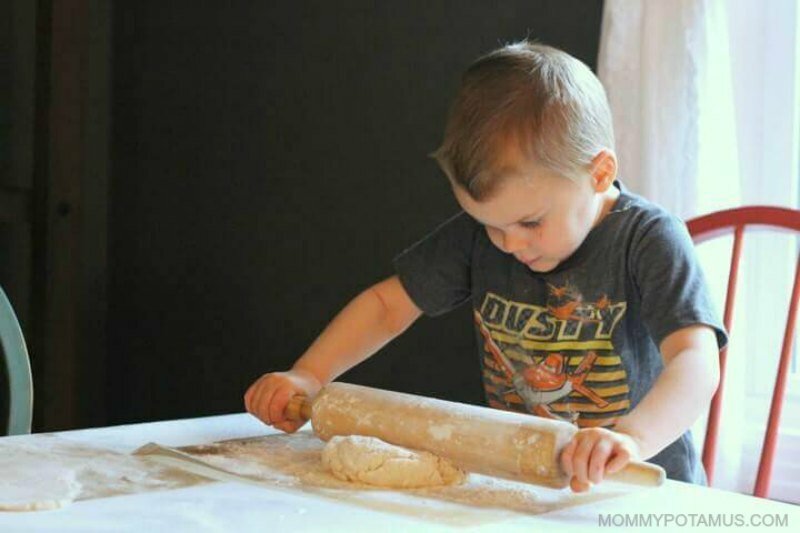 Use pencils or wooden dowels on each side as you roll so that dough is uniform thickness. Only roll the dough in ONE direction. Rolling back and forth can create the large flat air pockets. 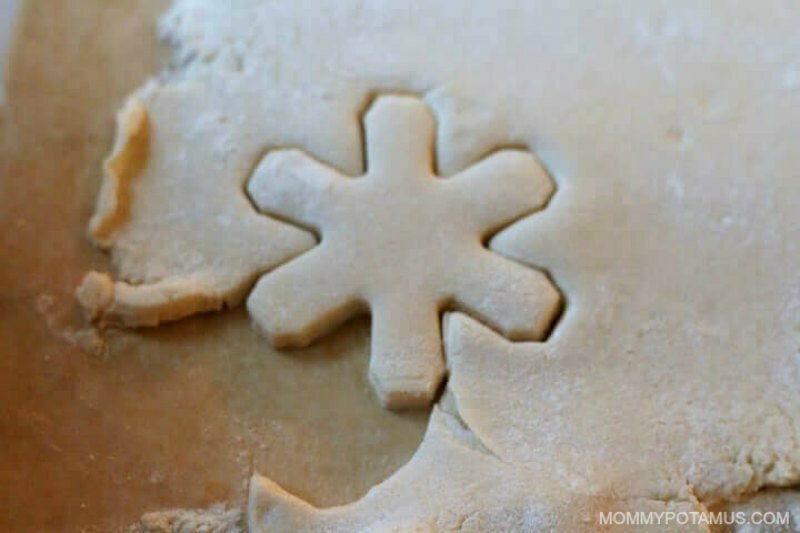 Press cookie cutters into the dough. Dip them into salt or flour if dough comes back up with cutter. Don’t move the cookie shapes. Instead, lift away the excess dough. Slide the parchment paper onto cookie sheet and place in oven. I made these with my children last night. I followed the directions exactly and they came out perfectly after two hours. we made these over 40 yrs ago. They are now cracking, crumbling, and flaking. i have glued them together several times. Is there something i can do to preserve them ? what is the best adhesive to bond the broken pieces ? Loved the selfies at the end.. you are gorgeous..
What brand or kind of paint did you use? I love the shades of color and the vibrance. 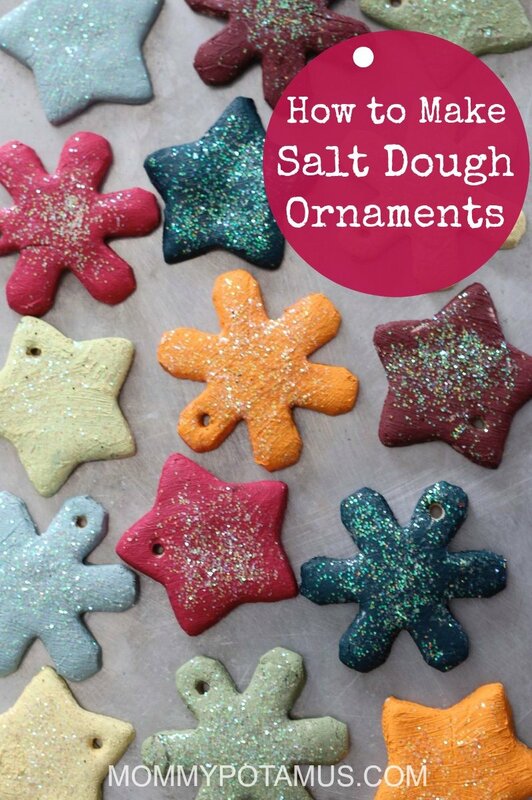 We made your recipe for salt dough ornaments this morning – thanks!! Unfortunately I totally forgot the ribbon holes, so we’ll have to just tie ribbon around them. But they look like they’re going to come out well anyway! Thanks for posting! I made these last night with my puppy and had her paw print pushed into the salt dough and it turned out soooo dang adorable. I even zapped it in the microwave at the end to make the drying time quicker! Thanks for this simple recipe! We referenced your blog on ours! Feel free to stop in and check out how ours turned out :). Happy Holidays! The last week of April I made handprint ornaments with my daycare kids using this recipe for Mother’s Day gifts. Today I attempted to apply the varnish and the varnish itself immediately separated, clumped and became crumbly. So After I brushed all that off the handprint ornament I attempted to apply spray varnish. I thought this was going to work until the varnish began to peel, like glue, over the whole piece. The only thing different that I did was I applied the acrylic paint in the dough instead of painting the item later. Do you have any suggestions or tips I can try to remedy my disaster? These puffed up insanely, even using ap flour. Now I have disappointed kids and I need to find another recipe to make gifts. They shouldn’t puff – did you happen to use self-rising flour? Mine puffed a little as well. I definitely used all purpose flower. Do you have any suggestions? More or less salt? Cook longer at a cooler temp? Thank you in advance! What kind of salr do you use? Thank you very much – I can’t wait to try these! We need to make 150. How many does this recipe yield? Thank you! It depends on the size of the cookie cutters you’re using. 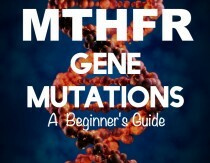 I recommend making a test batch with them and seeing how far one batch goes.